"These Mexican fritters are very common at fairs. In my border hometown, the line at this stand is always overwhelming. 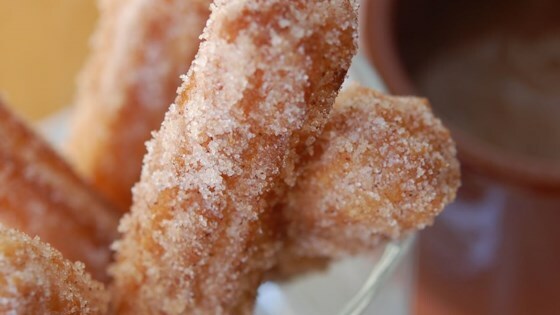 People wait hours in line just to get a taste of these churros. I have run across several recipes but this is the best one by far." Easy recipe Delia! My husband thought it was difficult to make. Did not have a pastry bag, so I used a ziploc bag instead to pipe into oil. I had no problems at all. These are very good, but just remember to pipe them very thin or you'll end up with raw insides and burned outside! Very easy recipe and outcome was excellent! Very authentic! Tip: Fry dough ASAP to avoid gooey mess. This was a really good recipe. My kids loved them. You can't handle too much and needs to be used asap or it will break apart while frying.